Let’s take back Ontario. Be part of the Power of Many by taking action on April 17. In a province-wide day of action on Wednesday, April 17, all day, all across Ontario, we will be sounding the alarm. We will be talking to the public, co-workers, neighbours, family and friends about what was in the budget and what’s at stake, so they can take action by talking to their local MPPs. Be part of the Power of Many. Join us to pass out leaflets and talk with people at busy transit stops, busy intersections, bingo halls, local coffee shops, outside workplaces, in workplace lunchrooms – anywhere we can share the message that we are the majority and together we can protect Ontario and fight for a province for everyone. Ford may have a majority at Queen’s Park, but we are the majority – we are the people! Let’s mobilize! We’ll have a downloadable leaflet for the April 17 action available after the budget is presented on April 11, 2019. Outreach actions will be planned all over the province. Sign up here to join an outreach action near you. We will message you with information for your area. 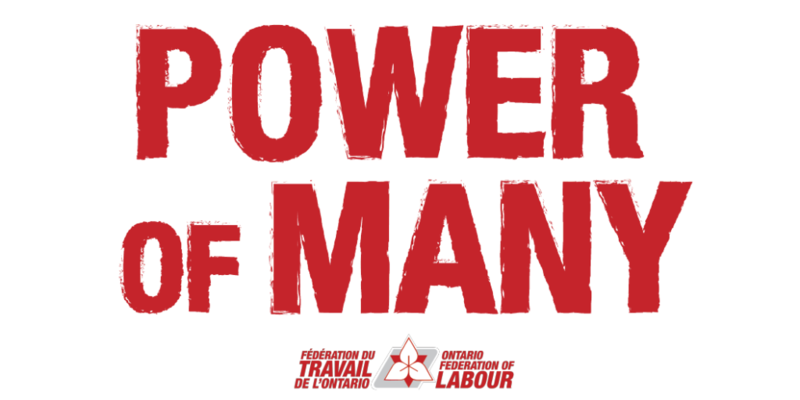 If you want to organize an action, sign up and let us know of your action by emailing info@powerofmany.ca. Check out our Facebook page and oflevents.ca for actions near you. Click here to sign up for the province-wide teleconference on Monday, April 15!